London - Arsenal risk losing striker Alexis Sanchez for free next season, according to manager Arsene Wenger, who confirmed the club have made no progress on a new contract for the Chilean striker. Sanchez, 28, is currently in the final year of his contract. He has been linked with a move to Paris St Germain in the current transfer window. "We have not progressed on that front," Wenger said in a news conference before Arsenal head to Stoke City on Saturday. "At the moment, he is a player who goes into the final year of his contract and prepares for the season. We have not made any progress on the other front. "It's not an ideal situation on the financial side and it demands some sacrifice ... but it doesn't mean the players who are in the final year of their contract will not extend their contract. We will work on that as well." Wenger said Sanchez is still recovering from an abdominal strain but is expected to regain full fitness before the club's match in Liverpool on August 27. 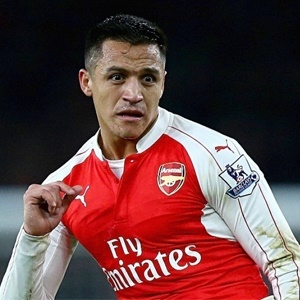 "For Sanchez, it (Stoke) looks a little early, but he works hard in training," Wenger added. "He should be available for next game against Liverpool. "His recovery is going very well, he is working very hard. But you have to be very cautious. It was a muscle strain and (you have to be wary) not to have any setback on it." The manager confirmed midfielders Jack Wilshere and Alex Oxlade-Chamberlain, who are also in the final year of their contracts, are firmly in his plans for the current season. Wilshere returned to action from a fractured leg during Arsenal Under-23's 3-2 win over Derby County earlier this week. "It's good that he is back and available," Wenger said. "I think he needs games now. He might play again on Monday night. He is not far away now." Arsenal began their campaign with a 4-3 home victory over Leicester City last weekend.